Resources and case stories to help local agencies inform residents about local government and civics, develop community leadership and participation, and create effective citizen academies. 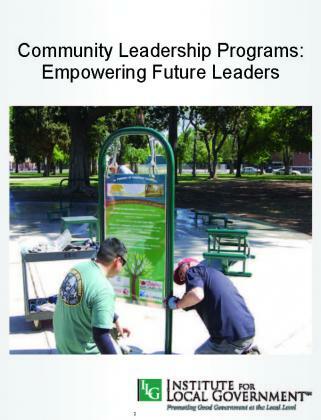 This paper discusses the mutual benefits of community leadership development programs to both local governments and their communities. Learn about key components of leadership programs, example programs from throughout the state and potential partnership options. Community-based leadership programs build skills and support the development of emerging leaders through a series of seminars, workshops and other local projects. This article includes tips on leaderships programs can help your community and how to find programs in your area. Learn about new civic education and municipal literacy projects for young people — in Colorado, Maine, and Kansas. A growing number of California cities are developing citizen academies. The Institute of Local Government has compiled this list of citizen and leadership academies as a service for interested local officials and others.